In a game where Aaron Rodgers throws for nearly 400 yards and four touchdowns, DuJuan Harris runs for 70 yards, and the offense puts up 34 points, you'd expect the Packers to come out on top, right? That'd be a reasonable assumption, but you'd be wrong. Between an awful start, pathetic third down defense, and some head scratching personnel moves, the Packers seeming maneuvered themselves out of a win against a Minnesota team that could do no wrong. Make no mistake, Minnesota won this game. The "we beat ourselves" excuse may carry water sometimes, but not this week. The Packers went out and lost this game, but the Vikings did more than enough to take it from them. Aaron Rodgers was brilliant, and probably has every right to be livid on the sidelines and in the locker room. So often he seemed ready to go, but couldn't get everyone else on the same page. At any rate, the Packers remain in the playoffs, but will face a Minnesota team motivated by a stunning upset. A Minnesota team that knows it has the recipe to beat the Packers. A Minnesota team that maybe, just maybe, has the stuff to beat the Packers in January. Aaron Rodgers (28/40, 365 yards, 4 TD) - Rodgers looked angry all day today, and rightfully so. His offensive line offered little or no protection (5 sacks, numerous hits), his receivers couldn't seem to get on the field quick enough, and the coaches seemed to be taking their sweet time calling in the plays. All this led to a ten point halftime deficit that put Green Bay so far behind the eight ball that they couldn't rally, Rodgers' best efforts be damned. DuJuan Harris (14 carries, 70 yards) - Harris, an undrafted free agent, has been the shot in the arm Green Bay's running attack appears to have needed. Although he never ran for more than 12 yards on a single carry, he still produced 70 yards on the day against a stout Minnesota front. Ryan Grant proved early on that he wasn't going to get the job done in the Dome, but Harris stepped in admirably and always seemed to be a block or a missed tackle away from a much longer run. Greg Jennings (8 catches, 120 yards, 2 TD) - Despite missing significant time with an injury this year, Jennings seems to be ready to revert to form. With Randall Cobb out of the lineup, Jennings showed why he'll be a prize in free agency this offseason, whether he's retained by the Packers or heads elsewhere. 0 - Turnovers forced by the Green Bay defense. The plan to beat the Vikings is a simple one: force a couple turnovers, build a lead, and force Christian Ponder to win the game on his own, rather than relying on Adrian Peterson. 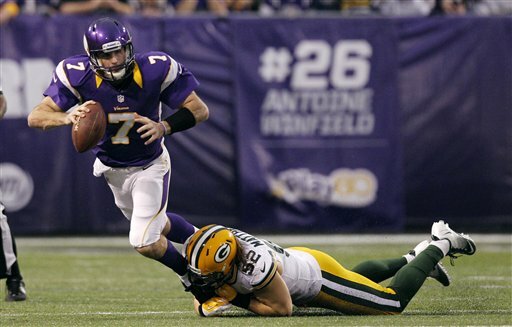 That obviously didn't happen, as Ponder played mistake-free football en route to the win. 6 - Made kicks by Mason Crosby, including both field goals (2) and PAT's (4). Crosby has now made his last four field goals and seems to be dragging himself out of the slump in which he's been mired for most of the season. 8 - Receptions by Jermichael Finley, bringing his total to 61 on the season. Though oft-maligned, Finley has been solid throughout the latter portion of the year, catching at least five passes in four of his last five games. Ready to Run - The football maxim says you have to run to win in the playoffs, and the Packers appear to at least have a competent running attack with as many as four different players potentially able to contribute. The extent to which the running game contributes may dictate how far Green Bay advances this year. Return of the Freezer - If John Sullivan is wondering why he wasn't selected to the Pro Bowl, B.J. Raji may have an answer for him. The nose tackle spent a surprising amount of time in the Minnesota backfield this week, beating double teams on a number of occasions to disrupt the run game at the point of attack. As often as not, though, the rest of the defense was slow to capitalize on Raji's strong play, missing tackles in the backfield that turned into long runs for Adrian Peterson. Doing Without - Green Bay showed they can make do without some of their bigger weapons on offense, most notably Randall Cobb. Although it didn't result in a win this week, players stepped up across the board to fill in for their injured teammates. Third Down Defense - The Vikings converted on 50% of their third down opportunities, not an exceptionally high number, but still high. What was costly, though, was the timing of those conversions allowed, specifically on the last third down conversion Minnesota completed. Facing third and 11 from their own 27 yard line, the Vikings gained 25 yards on what appeared to be a catastrophically broken coverage. You know the story from there. Coaching? Clock Management? - It's hard to know whose fault it is exactly, but the Packers seemed out of sorts in the first half, being forced to use timeout after timeout to get things straightened out. Indirectly, using up their final timeout of the first half may have cost them the game when Minnesota converted a long third down on a pass that appeared to hit the ground, then went on to score a touchdown. Green Bay would have been able to challenge the play and probably would have won, but they were out of timeouts and thus couldn't throw the flag. That's a tough situation that could have been avoided if silly mistakes wouldn't have been made. Mr. Official - Although there were bad calls both ways, that's not necessarily the worst part. This crew never seemed to be the ones "in charge" of the game. Too often, the players seemed to be doing whatever they wanted, and the men in stripes were simply reacting. And good call or not, the sequence of events on the James Jones touchdown/Mike McCarthy challenge was about as poorly run as it could possibly be.